The PSC9132 for picocells can support 64 users in a single 20MHz LTE sector, with 150 Mbps DL and 75 Mbps UL. At the 2011 Mobile World Congress in Barcelona, Freescale Semiconductor announced their planned introduction of a set of "base station on-a-chip" SoCs - the PSC9130/PSC9131 for femtocells, and the PSC9132 for picocell and enterprise-femtocell applications - with the goal of availability in the second half of this year. Today, at the company's Technology Forum in Shenzen - China, Freescale announced that they have working silicon and are now sampling the products to selected customers. Stephen Turnbull, Division Marketing Manager for Freescale's Wireless Access Division, says that the PSC913X family is designed to be scalable from from small to large cells, by integrating multiple combinations of the StarCore SC3850 DSP and Power Architecture® e500 core, with the MAPLE-B2F Baseband Accelerator Engine. The PSC9130 integrates a single set of cores, which designers can operate at a 800MHz clock rate for residential femtocells that can support up to 8 users. 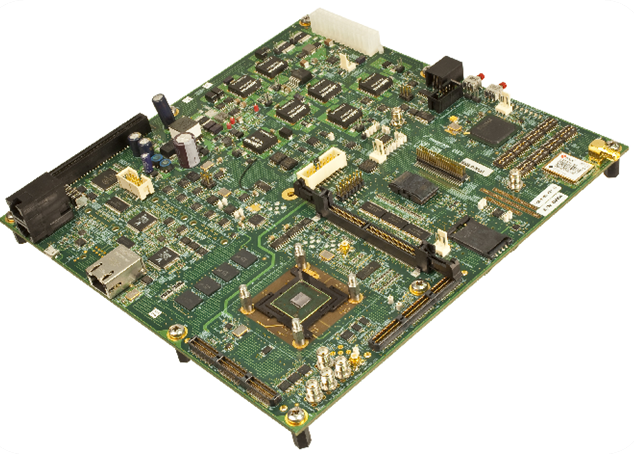 The PSC9131 offers increased capacity with a 1GHz core clock rate, for small-business applications with up to 16 users. All processors in the family support simultaneous multimode operation and a range of air interfaces. Single 20MHz sector LTE (Long-Term Evolution) Release 9 at up to 100Mbps (million bits per second) DL (download) and 50 Mbps UL (upload). WCDMA (Wideband Code Division Multiple Access) Release 99/7/8. The PSC913X support LTE in both FDD (Frequency Division Duplex) and TDD (Time Division Duplex) systems, and provide an interface for the JESD 207 Baseband Digital Parallel (RBDP) standard, and 2X2 MIMO (multiple input multiple output) antennae interfaces. Turnbull says that the PSC913X eliminate the need for additional support chips such as FPGAs. The products also provide support for GPS synchronization and 2G/3G sniffing, the latter a key to enable the future implementation of SON (self-organizing networks). The PSC9132 integrates a pair of e500and SC3850 cores with the MAPLE-B2P baseband accelerator. The devices can be operated with a 1GHz to 1.2GHz clock rate, to support up to 64 users for picocell/enterprise femto base station applications. The additional processing power in the PSC9132 can support a single 20 MHz sector of LTE with an increase in bandwidth to 150 Mbps DL and 75 Mbps UL. Antenna support is also increased to 2x4 MIMO. Freescale added a 4-lane SerDes (serializer-deserializer) to the PSC9132, combining 2x Ethernet SGMII (Serial Gigabit Media Independent Interface), 2x CPRI (Common Public Radio Interface) v4.1 with a 6.144G antenna interface, 1x PCIe (Peripheral Component Interconnect Express) at 5G x2 lanes, and a Quad JESD207 RF transceiver interface. Freescale and its partners are providing a range of L1, L2, L3 and transport software that has been integrated and tested on PSC9130/1/2 platforms. Freescale-licensed software is available for LTE-FDD/TDD and WCDMA (HSPA+) applications. L2/L3 Software for LTE-FDD/TDD and WCDMA is licensed by Aricent and Continuous Computing/Radisys.Transport software is offered by Freescale through the company's VortiQa package. Complete communications platform enabling LTE, WCDMA/HSPA+ and WiMAX. Dual-band system covering up to 2.7 GHz. Integrated Local and RRH (Remote Radio Head ) RF interfaces. Development and debugging tools available from Freescale and partners. Integrated with Analog Devices RF solution. Complete communications platform enabling CDMA-2000, LTE, WCDMA/HSPA+ and WiMAX. Integrated with Maxim and Analog Devices RF solutions. Freescale is currently sampling QorIQ Qonverge products to select customers.